Piao Wenyao 9P won the 13th Ahan Tongshan Cup yesterday, defeating Chen Yaoye 9P in the final (on September 20, 2011). The Ahan Tongshan Cup is a rapid tournament in China, which is also sometimes referred to as the Agon Cup, because it shares a sponsor with the Japanese Agon-Kiriyama Cup. The time allowed for play is slightly unusual, with players receiving 30 seconds per move and 10 x 60 second byo yomi periods. The byo yomi can be used if the players need more than 30 seconds on a particular move. Those who follow professional go may recall that Piao also won the 15th LG Cup, in February 2011. 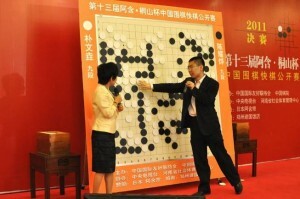 - Jingning; based on her original article: Piao Wenyao defeats Chen Yaoye to win 13th Ahan Tongshan Cup on Go Game Guru. Photo: Piao Wenyao 9P reviews the final game.